Everyone wants to be innovative. People do. Organizations do. So do governments. Being innovative is necessary for survival today. Everyone’s understanding of the path to innovation is different. Whether it is the government initiating a public directive like the demonetization of high value currency notes or a private organization launching a new product, it is critical is to be human centric. Real value is co-created with the end-user. In a first of its kind, this book uses a fictional story in the backdrop to demonstrate a 3-step structured approach towards innovation. The Probe-Ponder-Prove method or the 3P Method. This first version of the book is like a prototype and is an experiment in itself. Prototypes are made to secure feedback and use such feedback to improve any product or service. Readers are requested to leave their comments and suggestions, to enable an enhanced second version. “The Rich Labourer” is a rejuvenating book with concept touching the sky. 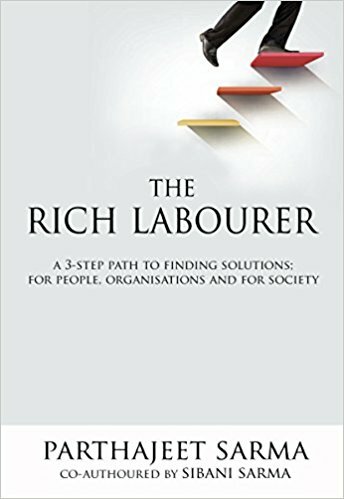 The book is about “A 3-step Path to finding solutions” and the author has tried his best in order to make the reader understand the concept by using a story. The idea of giving a fictional touch to a non-fiction book is really amazing and thus the book fits in every reader’s shelf. The whole theme is brought up in the form an idea, a dream which is seen by some team-mates. The characters were used well, there traits were not highlighted beyond use, making this book really to the point and precise. I loved the energy of Riya in the whole book. She was like ruling my mind when I learnt the need of understanding the solution before finding the solutions as this was shown at large. The idea of “Powerhouse” was a great blend in order to incorporate the 3 P plan in the scenario. Whole ideologies, brain exercises, the skits, the hard work shown was very exciting to see. There were small lessons which author hinted in between various scenes. I liked to notice the hardships, the planning and the final outcome. The small usage of Seema, Saee and Rakesh helped the book in one way or the other. Similarly, the part of Riya’s husband highlights some very important and fun facts about the environment we work in. The best part about the book was that the author didn’t try to showcase his intelligence over the topic. His attempt of teaching a concept to all groups of people was indeed a win-win. The examples used, the stories incorporated, the characters brought up in between, made a non-fiction book as interesting as a fantasy book. Talking about the writing won’t be helpful because a non-fiction book is full of technicalities and one can’t judge technical aspects. What can be judged is how well the author delivered his concepts; and that was done extremely well. What I thought was missing was a strong ending. There were some loose ends here and there but not major ones. Also over the end, the author became very descriptive and there were a lot of things which were hard to understand. If the same thing he could have blended in between somehow, while narrating the whole chapter of “Powerhouse”, then maybe I could have grasped those paragraphs well too. The book was a great read and can be read again and again to grasp the concept majorly. Entrepreneur and founder of innovation consultancy iDream, Parthajeet is a Chevening fellow (Oxford Univ.). he not only consults organizations at a strategic level, bus spends ample time on internal R&D efforts, which has led to award winning products and services, especially around mass housing. With a background in research, Sibani is the founder of skill development & capacity building firm, Galloper. She aids landowners; conceptualize realistic business models based on Viability-Feasibility-Desirability approach. Additionally, she enables training and skill development for students and professionals.